Whether there was or was not widespread counting of the breakdown of postal votes in the referendum, why has it suddenly become acceptable for politicians to admit that the practice is going on? The increasing number of postal votes and the pressure that is then created on counting/returning officers to open the ballot envelopes earlier provides an incentive for agents to organise counting, but does not explain the willingness of Yousaf and Davidson to talk about it on national television. One explanation is that this is an example of “normalised deviance”, where deviant behaviour becomes so accepted within organisations that people who are peripherally involved do not pick up that the behaviour is clandestine. The need to avoid leaving an audit-able trail of responsibility means that explicit statements that practices are prohibited are not made. If you are engaging in corporate malfeasance, you would not put a warning to that effect on all your presentation slides. The warning that the practice is deviant and the practice are separated, leaving some people inside the organisation, when faced with the cognitive dissonance of reconciling the contradiction, to assume there must be some loophole allowing the practice. Politicians and agents’ current perceptions of electoral law may have been shaped by the coverage of a similar offence in 2010. 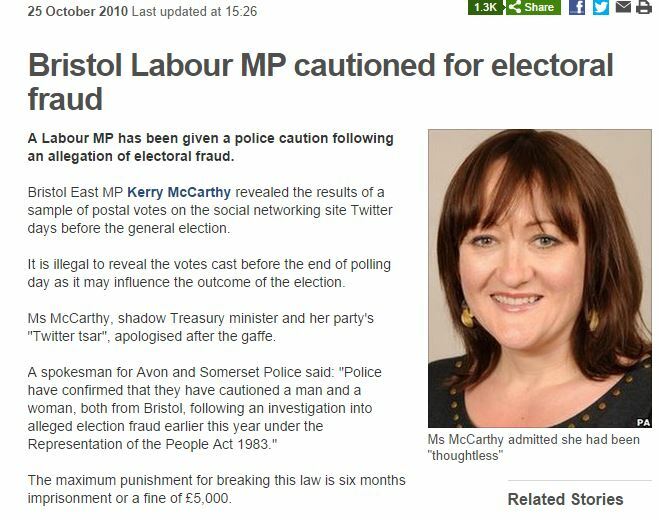 In the 2010 General Election, Kerry McCarthy, the Labour candidate in Bristol East, was officially cautioned by police for tweeting results collected at the opening of postal votes. Coverage concentrated on her offence of publishing the numbers rather than the offence of tallying the votes seen. 2.42 Three voting offences related to the RPA 1983 s66 requirement of secrecy. No case of this nature was reported in 2009. 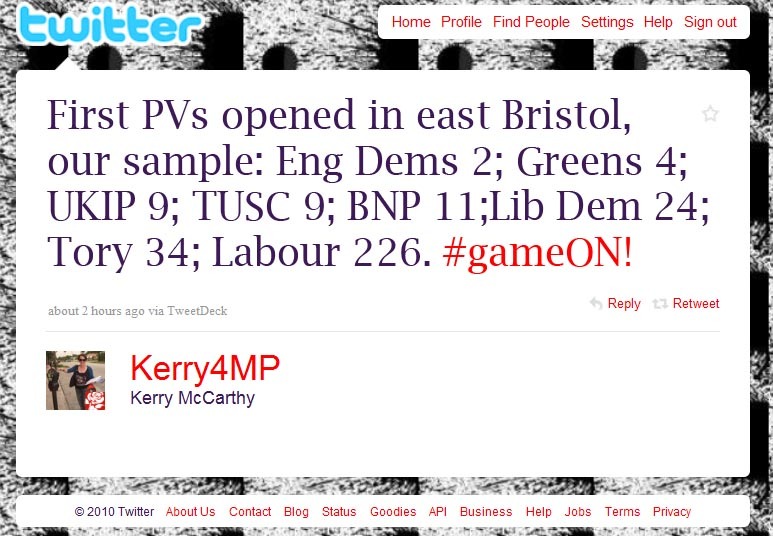 Two of these involved leaking turnout data from postal voting opening sessions in Bristol and West Lothian via twitter or blogs. In Bristol, the two people in question, one Labour candidate and one Labour Party agent, admitted guilt and were given a caution. The Lothian and the Borders police found insufficient evidence to take forward a prosecution in respect of the report in West Lothian. The remaining offence is still under investigation. Candidates have a legal responsibility to not communicate this information, but what was lost in the press coverage and the Electoral Commission/ACPO summary of the McCarthy case was that there was also the offence committed by whoever was collecting this information at the opening of the postal votes and possibly by anyone who was asking them to collect it. This focus on the leaking of numbers in Bristol rather than the collecting of them may explain Davidson’s belief that the potential offence was only communicating this information ahead of the close of polls and that collecting this information was unproblematic. This belief seemed to be shared on the election night broadcast by by Douglas Alexander MP, Humza Yousaf MSP, Patrick Harvie MSP and Professor Jeffery, any of whom could have pointed out that the practice she was describing is illegal. That no-one made a comment implies that this practice is seen as the new normal across the four parties represented on the panel. The increase in postal voting has made the offence of counting postal votes as they are opened more attractive to parties and, after the Bristol case, the existence of this abuse has been well-known. However, the potential risk of agents taking tallies at the opening of postal votes does not feature in the Chief Counting Officer’s Risk Register. This leaves the question, if the Electoral Commission and Returning Officers/Counting Officers are, since the Bristol East case in 2010, aware of this abuse, what have they done to prevent it?